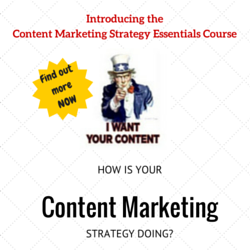 I always have a contrasted feeling when it comes to “Content” and web marketing. From one side, I consider it an excellent opportunity – as I will explain – also for small brands to earn momentum, visibility and authority in their niche. Considered the solution to every possible problem a brand has online (#contentisking). Maybe it is because once the web was mostly a written thing, or maybe for some other unknown reason, but when you ask an average marketer what content is, he will usually answer: a post (or an eBook or a long form). Maybe he will answer, an infographic or a video. Even if all those answers seem correct, in reality a post, an eBook, a long form, an infographic or a video are not content; they are containers. Content is the message (a story, data, practical information, a theory). Containers, or formats, are the means through which we communicate the message. If content is badly communicated, no format will make it shine. Whatever format you come out with and that has a sense. Moreover, we can have a content, which uses a main format as the main transmission medium, but others formats inside that first one. For example, we can narrate a story using the long form format, but including in that same format others like videos or interactive maps or charts, which will integrate and enrich it. Snow Fall by The New York Time is a classic reference in this sense. So, if we agree that content and container are not the same thing, what the hell is content? Content is the message, I said before, and a message is the explicitation of an information. That means that everything in a website is content. Therefore, basing our content strategy over how many infographics, blog posts, videos and/or long forms we will produce in a year is not a strategy. What kind of content we must communicate along its customer journey and the corresponding level of the funnel? That is better for fulfilling the needs of our audience? How can we measure the effectiveness of our content? Unfortunately, people usually base its strategy on point 2 (and only partly). With all the above said, I hope it is clear that I am not someone who is against things like content marketing. Not at all. Using content for marketing is an excellent strategy for any brand, and it is so since centuries. Because, let me share with you a secret that everybody like me, who had a professional life when Internet was still running on 14.4K modems, knows: the concept of brands as publishers is nothing new. In fact, there are still today many brands that publish their own physical magazines, especially in the B2B industry, and it is not a coincidence that usually the easiest way for enriching a website with valuable content is repurposing the one it produces for its industry magazine. Moreover, even if a business company doesn’t have a real magazine, very often we can discover, talking with its directors, that it is producing content in forms of white papers, academic studies and researches and presentations. In other words: many brands are publishers already; simply they are not aware of this other nature they have. However, there are also reasons tied to the actuality that make content a needed option for marketing a brand. Ad Blocking surely is an issue, not only for publishers but also for brands advertising themselves on those publishers. 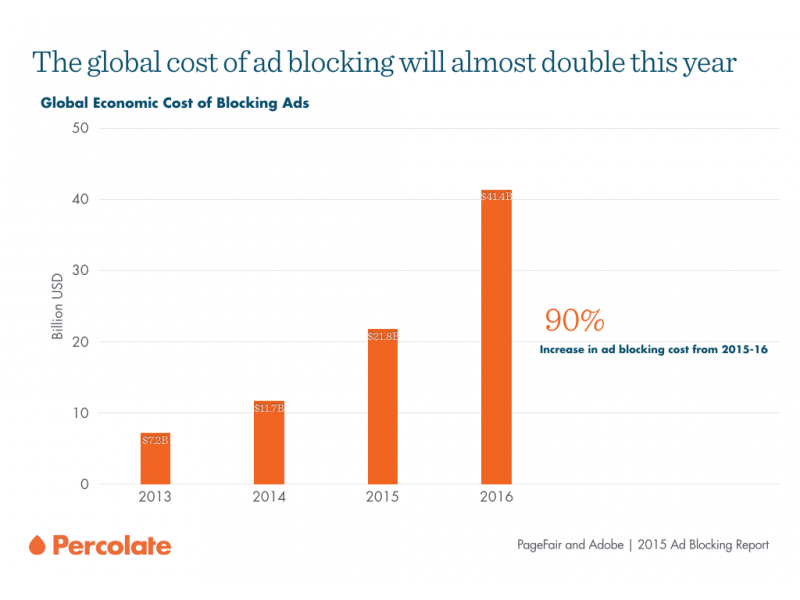 Percolate presented as interesting series of charts, which clearly present the reason of the Ad Blockers surge. For instance, the main reason people are blocking ads are not the ads themselves, but the loss of usability those ads represent, especially if they are consuming content on mobile. Going for “premium content” and the subscriber way, then, is the solution chosen by big publishers, and going with branded content, hence becoming publishers, is the way brands more and more are using in order to promote themselves in a not interrupting way. Content is a mean for earning organic visibility through the links it is able to earn (SEO). Content as a mean for improving conversions. These four objective, in my opinion, determines the ones of Content Marketing, SEO, Social, Email Marketing and Branding, and these are the ones that in reality all disciplines share, therefore over which we can plan a holistic strategy. Even though Content Marketing or Inbound Marketing or SEO seem the leading web marketing disciplines pushing Content to the actual hype, in reality for businesses for what it really matters is Branding. This association between Content and Branding is quite logic, if we think well, as it responds not only to a need brands have for promoting themselves using native advertising, but also because how people relates to Brands has radically changed along the years. Despite of the No Logo movement of the late ‘90s, people embraced Brands because these have been able to better propose themselves as the personification of values their audience owns. The stronger is this communion of values, the higher will be the audience LTV. For reaffirming and reinforcing this, Brands use content. When we think about great examples of content which is able to convert, we usually tend to cite websites like Airbnb, and specifically its apartments’ pages. Instead, I tend to cite the amazing job done by a Spanish website: regalador.com. A product page like this not only is “unique”, but – most important – is able to target and answer the needs of its users in two different stages of the funnel: Middle and Bottom. If we think at SEO, the page is able to target all the potential queries related to this kind of product. Finally, this kind of product page is able to conquer the trust of the visitors, who will remember Regalador as possibly the best site where to buy a gift knowing it won’t be sold on Ebay the day after. As I told before, everything is Content. This is something that comparisons websites know very well, because their web applications are their main content. 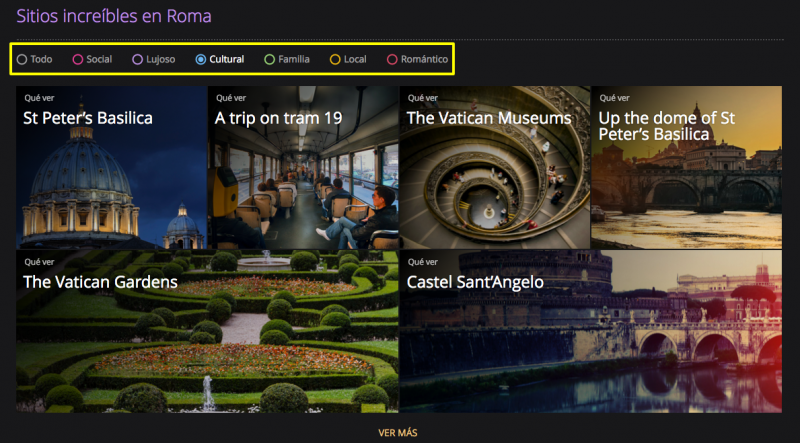 A good example of content as a product is offered by Momondo and its “Trip Finder” section, which is what makes Momondo different from others similar websites (similar function has the “Agony metric” in the case of Hipmunk). This page presents different kind of content, all of them with a specific purpose. However, the page also targets potential customers, who still are in the middle of funnel or, in plain English, people who decided already to visit a city, but still is not 100% convinced and want to know more things in order to take a final decision. Finally, we all know that cold information is not enough for taking a decision when it comes to travel. All the contrary, cold information about prices, weather et al usually are our own “rational excuses” for choosing something that we already have decided emotionally. Momondo knows it too, therefore present an almost infinite list of thing we can do once in Roma, classified for the most common reason hence able to target a wide range of Buyers’ Personas. One of the biggest problems related to content – especially when treated by disciplines like Inbound and Content Marketing – is that is thought exclusively for answering to buyers’ personas needs. I am not saying that that is not a correct way to think about content, but it is somehow myopic. In fact, a mom or a hipsters or a purchasing manager for a store or a bettor can be your buyer persona, but they don’t usually amplify your content so that it can reach new potential customers or help your brand earn a stronger authority and thought leadership. For achieving that objective, a brand must target its audience’s personas, or those sites and people who not necessarily are going to be your clients, but are indeed interested on its thematic and with the power of influence the buyers’ personas. A good example is what Bwin has done recently with Sport Buzz, a microsite targeting sport bloggers and journalists, who need to stay on top of the Twitter trends related to the main sports disciplines. 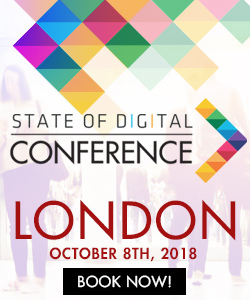 In this case the content is – again – the web application itself, which offers to journalists and bloggers the opportunity to discover real time (or almost real time) what is trending and the link most shared, hence to write an instant content (if not going newsjacking) and/or improve his own social content curation. 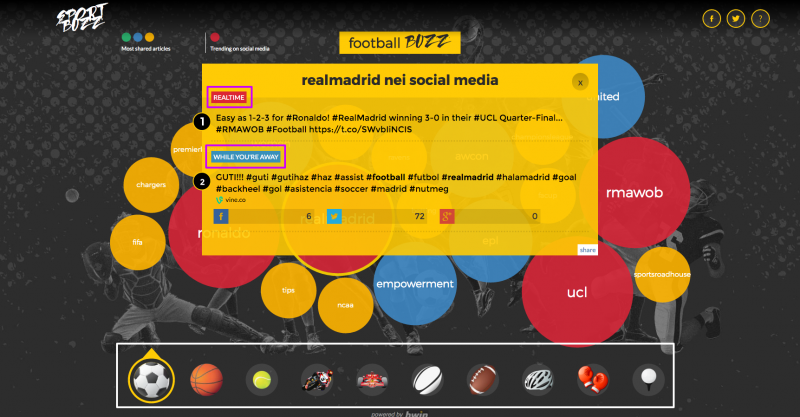 Sport Buzz does thanks a combined use of the Buzzsumo and Twitter APIs, being the second used in support of the first ones when Buzzsumo has not collected social sharing information yet. This is a very smart use of APIs for creating branded content and a technique to create content that still is not widely used by brands for producing valuable content, reserving its use only to subsidiary objectives. So, go to ProgrammableWeb and start really using your creativity! The best branded content is not only the one that make you want to share the content itself, but also the one is able to make long for doing the things that content is nonchalantly suggesting you to do. 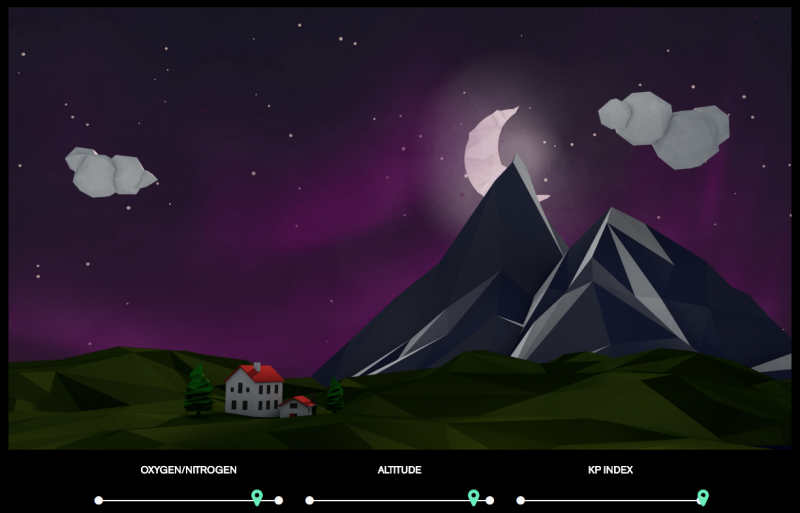 A great and recent case is the one represented by Northern Lights by Icelandair. This content, which sees a combination of formats (long form, live images, parallax + images and web application), has one purpose: making you desire to fly to Iceland and sees the aurora borealis with your own eyes. And this is what Icelandair really want to obtain, not links, because it offers several products related to Northern Lights (the Reykjavik city break, the Northern Lights vacation package), hence it wants to set up itself as the reference for this trending destination, which is also a very smart business strategy because it means bypassing intermediaries in customer acquisition. The Northern Lights content fulfill all its objectives very nicely. The written content not only satisfy every possible curiosity someone may have about the aurora borealis, but also – as the SEO in me couldn’t not notice, for instance check its title tag – it is able to potentially target all top of the funnel queries related to Northern Lights, and so, thanks also to the strong authority of the Icelandair website, able to be organically visible with no problem. 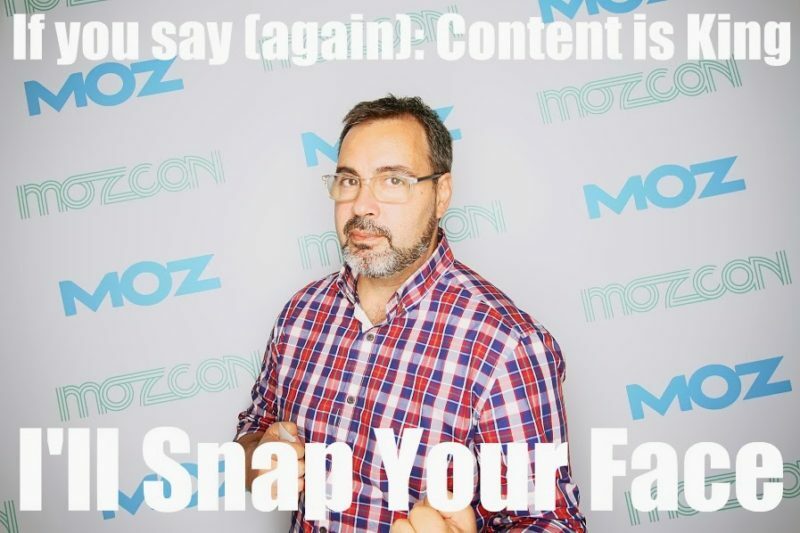 These are only few example of what content really is, and more you can find in the 10X content list curated by Rand Fishkin or in this very detailed post on SiegeMedia. As you have surely noticed, I haven’t talked about containers/formats, but about content: a message to someone about something expressed under one or more formats. Only if meant so, we can be allowed to say: Content is King. Would you like to have the entire events list available in Excel? Or want to add the events to your calendar or on publish it on your website? You can! Just add your details below and we'll send all you need to you! Want to add your event to the list? Submit your event here.